The Cardinals missed two field goals in the game, and lost a fumble inside the Wildcats' 5-yard line. "I'm sure we'll be kicking ourselves when we watch the film tomorrow," head coach Pete Lembo said. "I feel like this is one that we let get away, but it will be some good things to build on as well." Coming into the game, Northwestern had allowed just 16 points and one touchdown in three games, a 3-0 start. Ball State got the scoring going in the first quarter with a field goal by freshman Morgan Hagee to take a 3-0 lead with just over nine minutes left in the quarter. The Cardinals kept the Wildcats on their heels throughout the first quarter, using the running game to carry the offense. Ball State rushed for over 100 yards in the first half, and 181 total in the game. Northwestern came in allowing 110.7 yards per game on the ground. But Hagee's first missed kick from 43 yards out and quarterback Riley Neal's fumbled snap at the Northwestern 4-yard line kept the Wildcats in the game. The Wildcats took the lead on a 66-yard touchdown bomb with 6:20 left in the half to take a 7-3 lead. Ball State responded, however, as Neal connected with Jordan Williams for 22 yards to take a 10-7 advantage into the locker room. In his first career start, Neal finished 14-35 for 178 yards and two touchdowns. "I thought I have plenty of room to improve," Neal said of his performance. After halftime, Northwestern's offense came alive. The Wildcats scored two touchdowns on their first two drives to take a 21-10 lead over the Cardinals. Ball State's defense played well enough to win the game, forcing three turnovers in the game. Northwestern had only three turnovers on the season before this game. "Again, gutsy effort by the defense," Lembo said. "The third quarter was probably the worst of the four, but we gave ourselves a few chances in the fourth. ... Not a bad effort by any means." 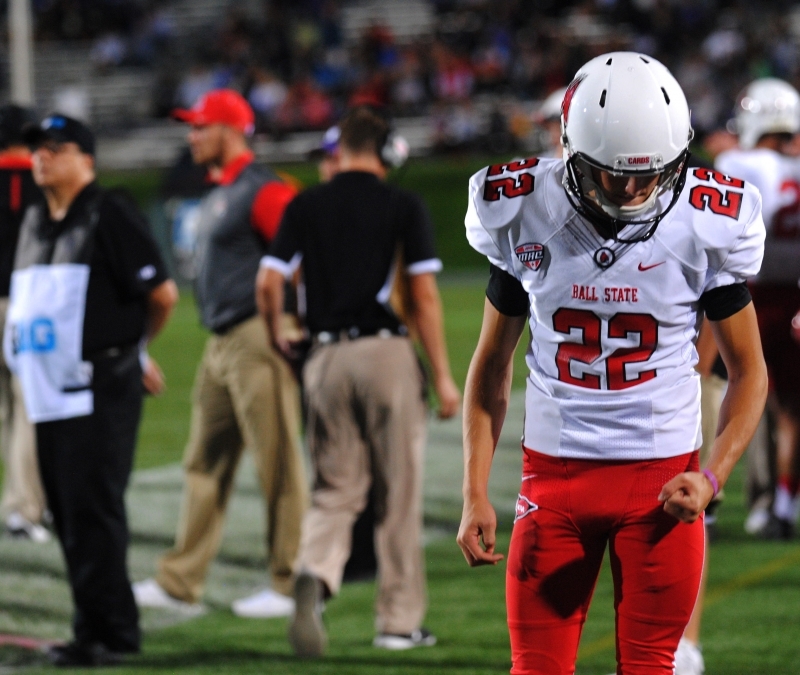 After Northwestern took a 24-10 lead, the missed opportunities continued for Ball State. It missed an extra point after a Neal to Williams touchdown pass and failed to take advantage of good field goal position. Williams finished the game with eight catches for 133 yards and two touchdowns. Ball State added a field goal from Hagee, who finished 2-of-4 in the game, to cut the score to 24-19 with 4:34 left in the game. But Northwestern milked the rest of the clock to win the game. Despite the close loss to a nationally-ranked team, Lembo is still disappointed with the loss. "We're just going to try to get better every day in practice, try to grow up a little bit and just keep playing," Lembo said. "We got a good bunch of kids." With the loss, Ball State falls to 2-2 (1-0) on the season.